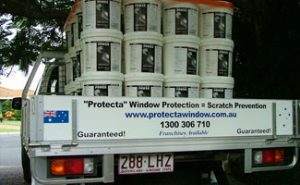 Take advantage of the product guarantee and the experience offered by trained Protect A Window franchisees. We offer a unique, service that provides superior long lasting temporary protection to prevent scratching and other damage to many valuable surfaces. Our highly trained, accredited applicators apply the protective coating on-site as soon as the surface is installed. Once construction is completed and protection is no longer required the coating is peeled off, leaving a scratch free and clean finish.